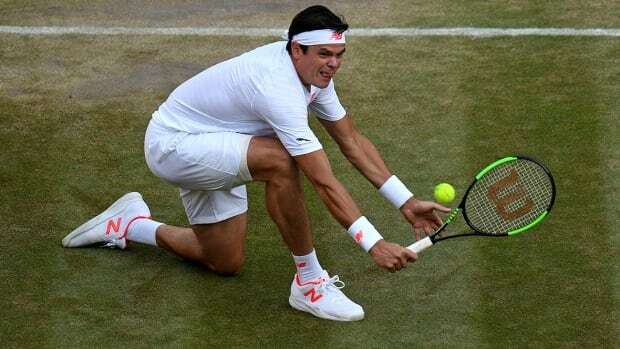 Battling both his opponent's powerful serve and his own injury-prone body, Canadian Milos Raonic made a quarter-final exit at Wimbledon for the second year in a row. Isner is the only player at Wimbledon this year not to have had his serve broken — and Raonic had just one break-point opportunity against the six-foot-10 American. Isner responded with an ace on that occasion and then went on to take the third set. Raonic, fell two wins short of matching his best showing at Wimbledon — a runner-up finish in 2016. Meanwhile, Roger Federer was a point away from a rather tidy, straight-set victory in the Wimbledon quarter-finals. One lousy point. Soon enough, Djokovic was on his way to the semifinals, where he will meet Rafael Nadal. The No. 2 Spaniard beat Argentinian Juan Martin del Potro 7-5, 6-7 (7), 4-6, 6-4, 6-4. The Ottawa native and partner Yifan Xu of China, the tournament's sixth seeds, defeated the unseeded pair of Bethaine Mattek-Sands of the U.S., and Lucie Safarova of the Czech Republic 5-7, 6-4, 6-2 in a quarter-final on Wednesday. Dabrowski has won two Grand Slam mixed doubles titles — the 2018 Australian Open with Mate Pavic and 2017 French Open with Rohan Bopanna.